My Little Pony Equestria Girls "Rainbow Splash" Tie-Dye Headband Kit Just $2.99 Down From $7.99 At Sears! You are here: Home / Great Deals / My Little Pony Equestria Girls “Rainbow Splash” Tie-Dye Headband Kit Just $2.99 Down From $7.99 At Sears! My Little Pony Equestria Girls “Rainbow Splash” Tie-Dye Headband Kit Just $2.99 Down From $7.99 At Sears! Sears has this My Little Pony Equestria Girls “Rainbow Splash” Tie-Dye Headband Kit on sale for $2.99 (Reg. $7.99)! 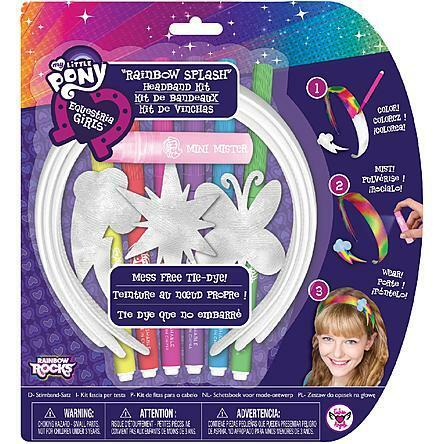 Color and wear this, your own Rainbow Splash™ Tie-Dye headbands with this kit from Fashion Angels™. Color the bands and cutie markers with the markers and mist to create a mess-free tie-die effect. Set Includes: 3 satin headbands & cutie marks, 6 colored markers, mini-mister, and instructional design guide.